Popular in many countries, the art of Bonsai revolves around growing trees in containers. To be true to the art, the trees should be container grown from a very early age. They are grown in shallow bowls and trained, pruned and root pruned into a number of recognised styles. It is possible to take lessons in the art of bonsai and grow your own trees, or you can purchase advanced trees. In Japan you will find examples of trees that are 100s of years old, some said to be nearly 1000 years old. The choice of pots, and the tools in basic care used are important and can also be purchased from specialist nurseries. Bonsai, in Japanese means tree and pot, originating in China in the 1600s bonsai has developed into a world wide artform. Can any tree grown in a pot be considered a Bonsai? Not if we take into account the Japanese concept of mochikomi, broadly translated to mean the process of the tree ageing in the pot for 10 years or more. Moyo-gi, an informal but upright style. Shakan, a leaning trunk or slanting style which gives a feeling of a natural windswept tree. Kengai, in this style the trunk bends down sometimes even over the side of the pot, as if weighed down by snow, or grown on a cliff. Hokidachi, a fan like style, often symmetrical. Bunjin-ji, a style that is a representation of the ideal form of a tree. What Plants and trees are suitable for Bonsai ? 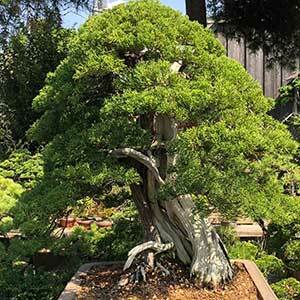 Technically any plant that will withstand root pruning and and cutting back, and then can cope with a very small growing space (a bonsai pot) can be turned into a bonsai. 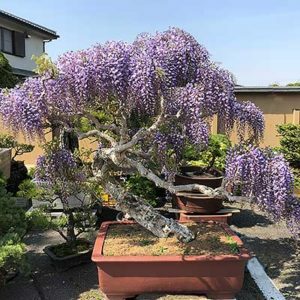 Pictured (right) is a Bonsai from a Wisteria. Most popular plants used for bonsai are conifers and ficus. Some Australian Native trees make great Bonsai specimens, Baeckea virgata (dwarf form) makes a nice bonsai. Two types of repotting are required. The first to refresh the growing medium, the plant can be repotted in the same pot after it is washed and cleaned. The second is if the plant is getting to big for the pot, it starts to look out of proportion, or even gets top heavy, reach for a larger pot. Look for a specialist Bonsai Potting Mix. Is Bonsai an indoor plant or an outdoor plant? Well no plants are really indoor plants, some just cope better than others. Provided good ventilation, light and proper care Bonsai do well inside. However they also benefit from some time outdoors. Your local Bonsai club is a great source of information on this. Tools range from bonsai shears and branch cutters to bonsai pots and wire for training branches. Both Japanese and Chinese Bonsai tools are available for sale online in Australia. See suppliers listed below. Caring and pruning bonsai is specialist work and does require specific tools, here we list the basic tool set. Pronged Rake with shovel – Used for clearing soil from root systems. The shovel is used for tamping down the soil. Miniature broom – Used to clean up after pruning and repotting. Leaf Tweezers – Used for removing dead leaves. Wire Cutter Scissors – Used for cutting wires. Pruning shears – Used for light pruning and leaf pruning. Butterfly shears – Used to prune prune leaves, small branches and even roots of your bonsai trees. Bonsai Trees, Pots and tools for sale online. Courses, resources, tools and general information on all things bonsai. We specialise in styling large specimens. Servicing , starters, pots, tools and moss all available. Bonsai stock, finished plants, pots, tools, wire, soil, figurines and workshops. Canberra’s Home Of Award Winning Bonsai. Retail and Wholesale Nursery. Sales, Service, Classes, Hire. Trees up to 50% of retail.Purchase ready to go trees, shaped, potted and wired. Range of Glazed and Unglazed Pots, Chinese and Japanese Tools, excellent selection of Books. Nursery, sales, care and maintenance, repotting, materials,lessons .